In his state of the Union speech, European Commission President Jean-Claude Juncker made a strong call for European unity and a positive agenda at the benefit of EU citizens, despite current challenges. To avoid social fragmentation and social dumping in Europe, he proposed that Europe should establish a European Social Standards Union, beginning with an agreement by Member States on the European Pillar of Social Rights. With regards to employment, Juncker insisted that there should be no second class workers and suggested to create a common European Labour Authority to assure fairness in the single market and the respect of labour mobility rules. 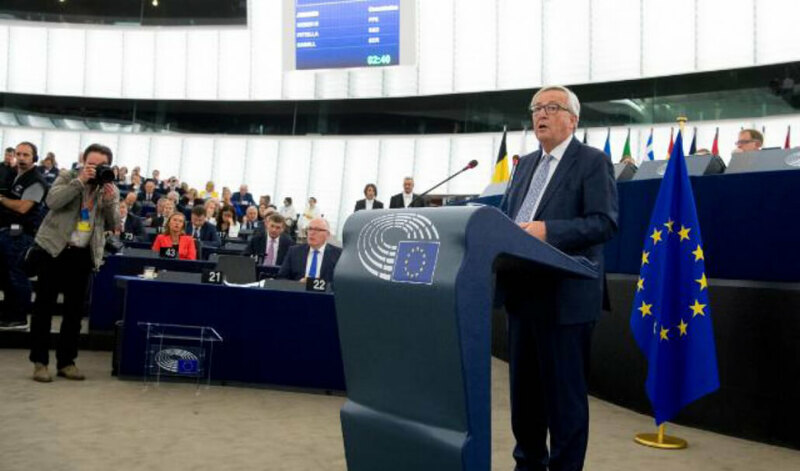 Mr Juncker started his annual state of the union speech at the plenary session of the European Parliament in Strasbourg on 13 September by claiming that “the wind is back in Europe’s sails” in light of the current positive growth and employment trends. He argued for using the current window of opportunity to move forward in the framework of a “sixth scenario”. Repeating his criticism of “EU-bashing”, he said that everyone gets credit when the economic outlook is good, but only Brussels gets blamed when it’s bad. In his one hour speech, the Commission President outlined five priority areas for EU action. With regards to trade, he laid out conditions for future agreements, including social, environmental, data protection and food safety standards. Remarkably, he called for a new framework for investment screening to assure the defence of EU’s strategic interests. To increase European competitiveness, he announced a new industrial policy strategy for Europe to become the world leader in innovation, digitisation and decarbonisation.